Work, household chores, errands, playtime, dinner, laundry—with so many things to do and not many hours in the day, finding time to exercise is difficult. To help you fit in the physical activity your body craves, we’ve rounded up some simple, quick workout routines you can fit into your daily schedule. With these fast exercise ideas, you’ll be able to stay moving even when you don’t have time to hit the gym. Wake up and warm up with this in-bed exercise! Lie on your back and lift your legs about 6 inches off the bed. Keep your abs tights, back flat, feet together, arms to your sides, and knees straight as you use your feet to draw small circles in the air without touching the bed. Do 20 circles clockwise and 20 circles counterclockwise. Brush up on your calf raises while you brush your teeth! Start flat-footed and raise to your toes until you get a tight flex. Do 3 sets of 20 reps. If you have a desk job, it’s important to get up and move at least every 2 hours. Do some standing stretches for your arms, neck, back, and legs; squat a few times; or walk around your floor or building. The movement helps your body and helps you clear your head and stay productive! Stuck in 5 o’clock traffic? Turn up the radio and move to the beat. You’ll burn some extra calories and make the wait a little more fun. For an extra boost, add some ab, glute, or thigh flexing. Just make sure you keep an eye on the road and remember safety first! Start by sitting up straight. Squeeze your glute muscles and pulse 50 times. Rest for 5 seconds and repeat until you feel a good burn. Take your desk workout a step further and work your thighs too! Place your feet on the floor with your legs together. Press your knees in so you feel your inner thighs working. Pulse 50 times and repeat as desired. Make exercise fun for the kids! If you have a baby, hold a plank position on your hands for 30 seconds while your hover over him or her. Lower into a pushup and kiss your baby on the forehead. Come up and repeat as many times as you can. Give your legs some attention by doing wall sits as you read your children a book or review their homework. Burn calories while you clean the carpet. Push the vacuum only as far as your arm extends and return it to your body without moving your feet. Switch arms every 5 minutes. This quick push-pull motion targets your arm muscles and burns up to 100 calories in 30 minutes! The heavier your vacuum, the more strengthening this exercise is. Use the same method of mopping and sweeping—you’ll burn up to 100 calories in 30 minutes while mopping and 100 calories in 45 minutes while sweeping. Burn a few extra calories and clean the baseboards too! Take advantage of your downtime during dinner! Do some push-ups against the counter while the vegetables cook or jumping jacks while you wait for the water to boil. Do 3 sets of 20 reps of one or both exercises. There’s nothing wrong with sticking to the classics, and a walk around the block is fun for the whole family. Take your kids, spouse, or dog for a 10-minute walk around the neighborhood. This is a great after-dinner activity to beat a post-meal crash. Plus, you can spend time with your family and stay moving. Unwind after a long day with a few calming or rejuvenating yoga poses. 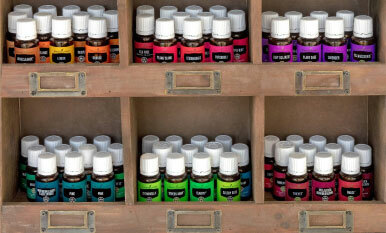 Pair your practice with your favorite essential oils such as Frankincense, Lavender, or Stress Away™. 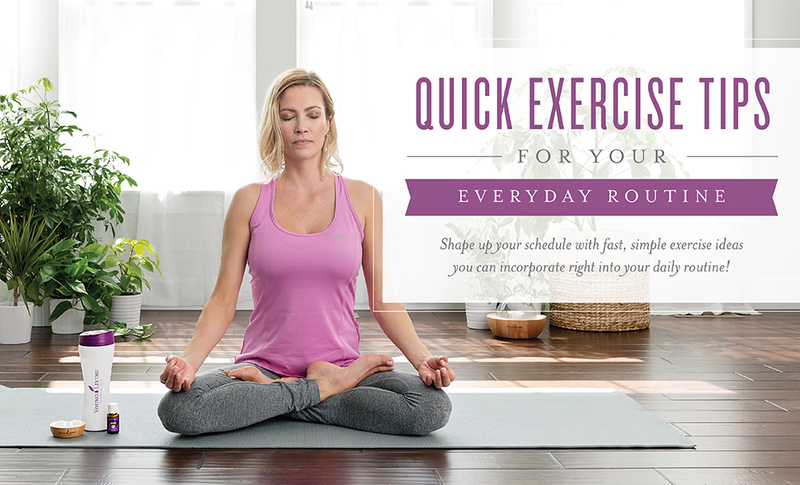 Try some of our simple, sweat-free yoga poses to get started! Remember to hydrate all day to make your moves most effective and keep your body healthy. Add Vitality™ oils to give your water an extra splash of flavor! Congratulations to Anne D., our lucky giveaway winner! We truly appreciate everyone that shared their quick exercise tips to stay in shape! What exercise tips help you feel the burn throughout the day? 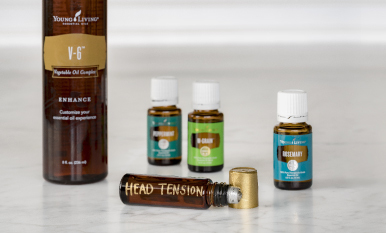 Share your suggestions below for a chance to win 15ml Frankincense, 15ml Stress Away, 15ml Lavender, and Pure Protein Complete Vanilla Spice (valued at $252.30). One winner will be chosen at random and announced on the blog on Friday September 16th.